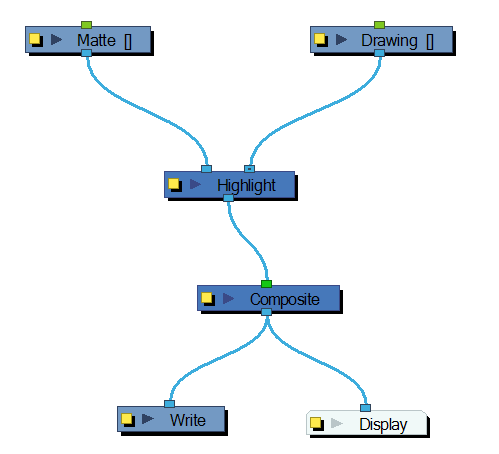 Use the Highlight effect to turn a drawing's area lighter to simulate a light source. To produce the highlight effect, you must draw a shape to control where the highlight will appear on the original drawing. The Highlight effect uses a matte to determine the shape and position of the highlight on another element and can blur the edges to create a softer effect. Use the Highlight editor to control the type and amount of blur, as well as the colour of the highlight effect. • Truck Factor: Activated by default, this option readjusts the blur when the element undergoes a change of depth or scale. When this option is disabled, the effect's values remain unchanged regardless of depth or scale changes. It is recommended that this option be disabled when multiple drawings are composited and attached this effect. • If Directional is selected, Harmony will blur the matte in the direction you select. • If Radial is selected, Harmony will blur the edges of the matte evenly around points that make up the edge of it. • Directional Fall-off Rate: The distance where the directional blur fades from the edge of the image. Select a value between 0 and 1. • A fall-off rate of 0 causes the blur to fade out slowly, distributing the blur evenly from the edge of the character to the farthest edge of the blur. • Invert Matte: Activate this option to invert the matte used to create the highlight. • Use Matte Colour: Select this option to use the colours in the matte for the highlight effect. If you deselect it, use the Colour section to select colour and alpha values. 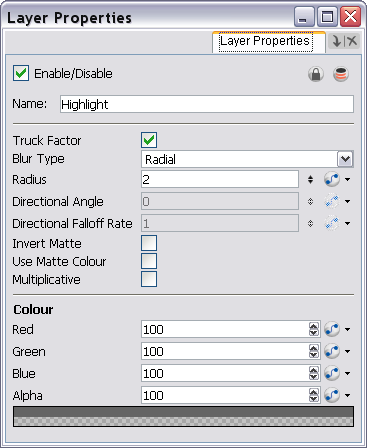 • Multiplicative: Select this option to create a more diffused highlight. • Red/Green/Blue/Alpha: In the RGBA fields, enter the value that you want added to or subtracted from the colour channels in the drawings. Alternatively, you can attach these values to function columns to animate them over time.